Antonin Artaud, without a doubt, one of the fascinating figures out of French literature/drama. Over the years, I have read pretty much everything by and on Artaud. A very difficult subject matter because he's like a spirit than a human being. Artaud, the artist/writer, is probably one of the most articulate individuals to describe the essence of his physical/psychological issues. It seems everything he has done, even as an actor in films, is his porthole to his inner demons. It's a fascinating match-up of having such a profound thinker like Jacques Derrida commenting on Artaud, his drawings, and also the relationship between having such an artist like Artaud, within the walls of the Museum of Modern Art (MoMA). Which is the double-whammy in this book, because Derrida also questions the nature of a museum and what role it has in someone like Artaud. "Artaud the Moma," which is a pun or wordplay of Artaud's name for himself 'Mômo,' which is French slang for 'fool.' Derrida's insightful, but a difficult reading of Artaud's drawings is a lecture he gave at MoMA in 1996 during the exhibition "Anton Artaud: Works on Paper." I read this book in two settings, and it's only 94 pages long. Still, it's like listening to a great Be-Bop jazz musician tearing apart a traditional melody into little pieces, and then building it up again. On the other hand, writing about Artaud's aesthetic and art is not a straightforward manner. To write about such an artist one has to force themselves at the entrance of the gate, and work your way out to the backyard exit. 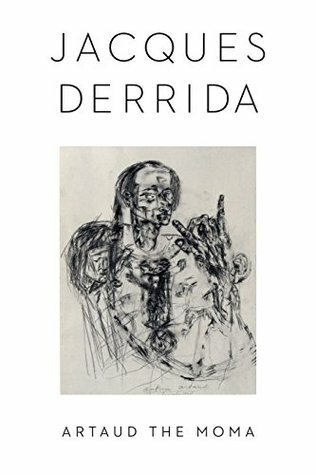 It's a fascinating journey, and Derrida's thoughts on Artaud's insanity as well as his superhuman effort to express himself, not only in the confines of his illness, but also in institutions such as mental hospitals, and there even museums.